Keeping your boat clean and shinny is critical to maintaining its value. For all the beauty and enjoyment Lake Tahoe boating offers, it's not without elements that can effect the appearance and value of your boat. Namely, the extreme sun which can cause oxidation of your gel coat (which will leave a white chalky surface) and the high mineral content of our water which can lead to hard water spot development (a rough white fish scale type of surface upon gelcoat). Removing oxidation and hard water sports and protecting from future development is central to our detailing process. So whether its a simple wash, vacuum, wipe down or the total "buff-out" detail, our trained detailing team is ready for the job! Tahoe Boat Management provides scheduled maintenance and repair services through our professionally trained and experienced technicians. Whether it be an oil change, tune up, drive service, 100 Hr. service, mechanical repair, gel coat repair, canvas or upholstery repair, installation or upgrade, we're standing by to keep you moving. Storing our boat outdoors can be an economical alternative to indoor storage. However, we would never recommend it without first shrink wrapping it. The elements of winter weather, not least of which include rain, snow, wind, dirt/dust, sun and freezing temperatures would wreak havoc on your boat. Our process of shrink wrapping will provide a tight and secure vented "tent" over and around your boat, protecting it from such conditions. A properly wrapped boat will be in "as good"
condition in the spring when you open it as it was in the fall before wrapping it. So, if you're considering storing your boat outdoors this year, call us and our mobile shrink wrap service will come to you and have you wrapped up for the winter. 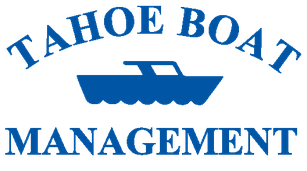 Tahoe Boat Management has a fleet of three-quarter and one-ton Pick-Up Trucks and is available for both local and long distance transportation. Our trucks are capable of hauling up to 16,000 lbs. and with over a couple hundred thousand accident free miles under our belt you can expect safe and reliable transport of your boat. Due to fuel cost fluctuations, rates are subject to change. Please call Steve for a quote: 775-287-1089. Storing your boat properly for the winter is critical to its longevity. Our technicians will properly stabilize your fuel, fog the interior of your motor, drain your motors cooling system and holding tanks and disconnect and store your batteries as part of our winterization service. Equally as important as winterizing is de-winterizing and activating your boat in the Spring. Our service includes installing drain plugs, connecting water hoses, charging and installing batteries, checking and topping off fluids, checking belts and connections, starting and running your boat and ensuring its sea worthiness.